The SPX hit 1150 this week making a new rally high less than 1% below my target of 1158. The wave structure also looks completed, thus I think the top is also in for the SPX. 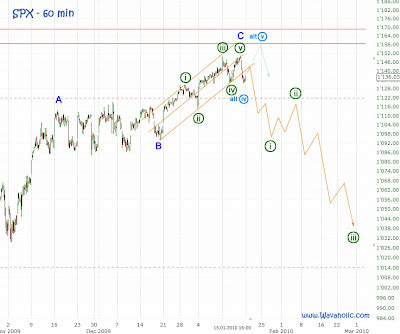 I added the alternative count also for the SPX but for the reason I explained in yesterday's Nasdaq post I don't think it will happen. The best thing about next week is by the way that the US markets will be closed on Monday, so, we won't see the usual gap and ramp up on Monday : ) May be that's what the bears have been waiting for lol.